Why are Russia’s military jets landing on rural highways? At the beginning of Januaryan Su-34 heavy bomber and two Su-30M2 fighter jets landed on a federal highway in the Rostov region (1000 km south of Moscow). 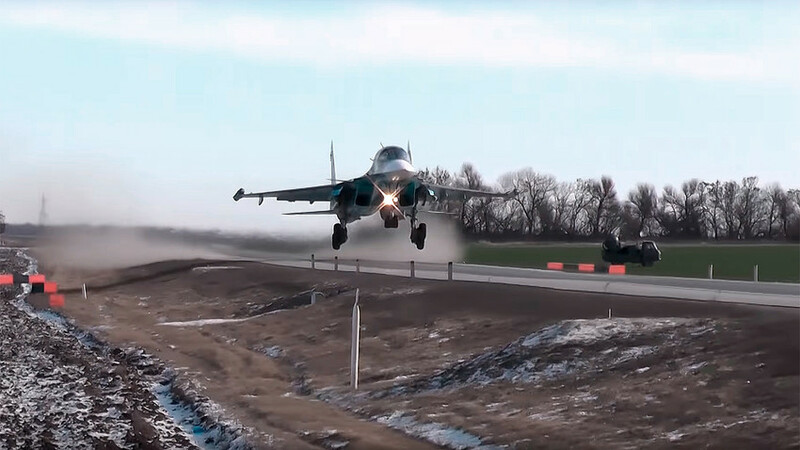 The stretch of tarmac is usually packed with cars, but the Russian military hijacked it for drills to test the skills of pilots: Could they land their multi-million dollar machines on a short, thin runway? The makeshift runway was only 18 meters wide, two times narrower than a normal military aviation one. Just in case you were wondering, the military police closed off the highway to traffic while the drills were going on. Dodging civilian cars would have certainly added an extra dimension to the tests, but not this time. According to Russia’s Defence Ministry, the pilots didn’t fully stop, but took off every time their aircraft's wheels licked the road’s surface. “Pilots performed the drill dubbed the ‘conveyer’ - when they only touch the ground with their back wheels, and then immediately take off without losing speed,” the Ministry explained. The fighters and bombers also carried out a simulated aerial battle while executing complex aerobatics. The forces protecting the runway repelled a staged attack, while a Ka-27 helicopter completed a practise rescue mission. This is the first time tactical landings of heavy bombers and jets has happened on one of the country’s highways. However, Russians are no strangers to the Air Force’s antics. Nevermind being rear-ended by another car - what about a plane!